This find was a bit of a surprise to me as a had never purchased one before: a vintage globe. 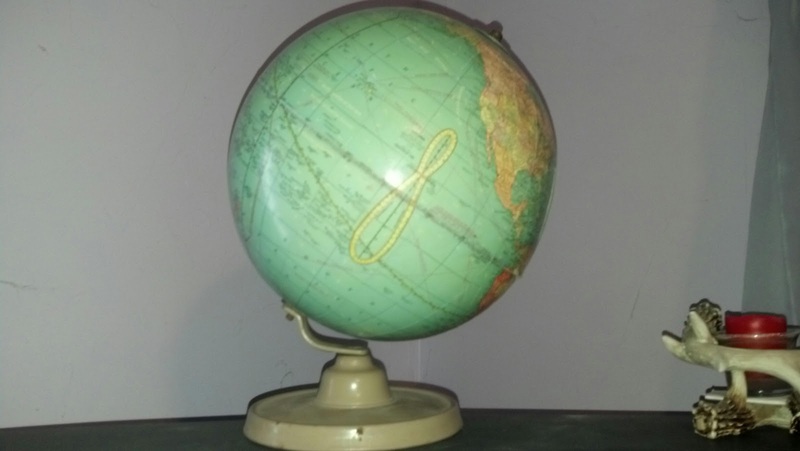 To be specific a Cram's Universal Terrestrial Globe, 9 inch, Indianapolis, Indiana. I've always had a soft spot for vintage school items but at the time of purchase I wasn't exactly sure of how old it was. I did note that the Soviet Union was in existence, but aside from that it was a shot in the dark. All I know was that it was cool and only $3 so I could afford it. Then after I came home I did some research. The pleasant surprise I'm sure you all saw coming: I believe it dates to roughly 1949. You may be wondering how exactly I proceeded in dating it to that point. It was a lengthy process of looking up multiple countries online to check and see when their time period of existence was. I could have substituted it with merely googling "How to date a globe?" but at the time I was too excited. None the less, I can't help but wish I had some more minor facts and check points while actually in the store...wandering around...pondering whether it was a good purchase. Because had I not successfully talked myself into it, I would have regretted it. Which is why I'm creating a mini blog within my blog post per say. Is Czechoslovakia present (Later Czech Republic)? How about the Soviet Union (Later Russia and other small countries)? Is Germany separated into East and West? Do you see the Tanganyika Territory in Africa? How about either French Equatorial Africa or French West Africa? Is Anglo-Egyptian Sudan below Egypt? Is there French Indochina where you would expect Vietnam and Cambodia? In addition to it being some fun facts to everyone reading...it will also ensure I don't forget should I ever find a globe again as writing/typing things drills them into my memory. Although these dates may not be completely exact, it was what I had found and can serve as a guideline. That's all for now folks. Hopefully I'll be putting my new Christmas goodies up to share soon. Happy thrifting everyone. Thanks! That was really helpful. I just dated my globe to between 1949 and 1954. Love it! That's fantastic SusieQT, I'm glad it could be of use!